Southern California promises almost year-round fun in the sun and with that vitamin D-filled vow comes the added bonus of an almost nightly solar-powered light show. Get to one of these 10 Los Angeles spots as the sun dips low to catch all the golden hour glory. Sunsets can be fun for the whole family when you watch them from the Santa Monica Pier’s amusement park. While you can certainly see the horizon change colors from just about everywhere on the dock, except the bathrooms, the best view is from 130 feet above it atop the Pacific Wheel, the world’s only solar-powered Ferris wheel. Once the sky has gone dark, riders are treated to a second light show when more than 174,000 energy-efficient LEDs blink to life and dance on the ocean’s surface below. 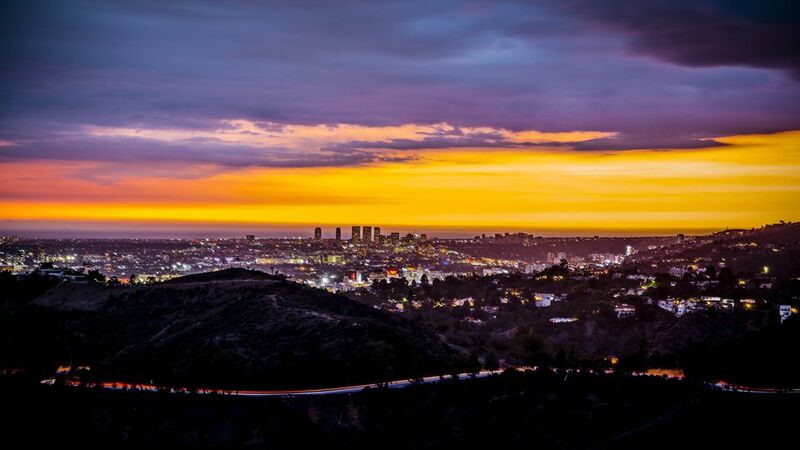 Cap off a visit to one of Los Angeles’ most iconic tourist attractions (and filming locations) by taking in the sunset from its mountaintop perch in Griffith Park. With the city far below, bucolic splendor at your back and unobstructed sightlines from downtown to the Pacific, it’s great for escaping the hustle and bustle and for a cheap date idea as access to the 1935 observatory and its telescopes is free. Complimentary Wi-Fi allows visitors to post FOMO-inducing photos in real time. Located on a strip of sand locally known as Billionaire’s Beach, this chic oceanside boutique offers several options for staring at the sun. People who prefer to do it in private can book a guest room and pull up a chair on its balcony as all 47 have one (and most provide full ocean views). Descend to sea level and congregate on chaises as the sun ducks behind the pier or grab a table on Carbon Beach Club’s terrace for sunset with a side of chocolate caramel tart. Since 2014, dusk devotees have had another reason to park themselves on this 288-acre piece of Playa del Rey coastline. A 70-foot wooden boat was marooned on shore. Unable to be removed, it has become an ever-changing mural tagged by graffiti artists and adds a slice of urban life to your sunset shots. Plus, there are fire rings, picnic facilities, a very long biking/jogging path, volleyball nets, jetties to fish off of and bird-watching of the federally protected western snowy plover to fill the hours before the sun says goodnight. Savor fine art, 360-degree scenery, architect Richard Meier’s gleaming travertine masterpiece and spectacular sunsets while wandering the grounds of this top-notch free museum set on a peak in the Santa Monica Mountains. If rare poor weather forces you inside, head to the paintings galleries on the upper levels of the North, South, East and West Pavilions as they all feature interiors naturally lit through glass walls, allowing you to glimpse the sunset from indoors. The Roman gardens at its sister museum in Malibu, the Getty Villa, also boast a great end-of-day vantage point. The sunset-peeping possibilities are almost endless at this sprawling Mediterranean-inspired luxury retreat on the Palos Verdes Peninsula. See the pink, yellow and orange swirls while floating in one of four pools (including the adults-only bluff-top plunge that looks out to Catalina), spinning in the gym, golfing the nine-hole course, relaxing on your casita’s plush bed, rambling around grassy and rocky paths or listening to live music on Nelson’s patio. Whether of the celebrity or night sky variety, star sightings are common at this posh market-driven eatery with a menu curated by top chef Jean-Georges Vongerichten on top of the 12-story Waldorf Astoria in Beverly Hills. Sink into the velvety emerald cushions while the sun sinks behind Century City’s skyscrapers creating a color palette that matches your spiced pineapple mai tai or tuna sashimi with tropical fruit. High in the hills above Burbank with panoramic views of the San Fernando Valley and downtown LA, this historic haunt went through an extensive $10 million remodel, adding the intimate Green Room bar, mid-century modern flair, a meat aging room with walls made of Himalayan pink salt and picture windows that open fully to create indoor-outdoor flow. The dining deck is the optimal choice at twilight, but don’t fret if it is full as the multi-level design means there isn’t a bad seat in the house. Formerly known as the US Bank Tower and famous for being obliterated by aliens in "Independence Day," this high-rise in downtown debuted several public spaces — a bar serving locally brewed beer and light bites, California’s tallest open-air observation deck, an event space with floor-to-ceiling windows and a unique Skyslide — in 2016. After the sun hits the horizon, ride down the 45-foot all-glass slide attached to the side of the building nearly 1,000 feet up if you dare.